At a time when France is set to sell bonds, the euro reached a low that was the first of its kind in eleven years, against the yen. One of the reasons behind this was the underlying concern that banks and the government in the region will face troubles in raising funds. Recently, the currency, which is used in 17 member states of the total 27 in the European Union, fell against most of its strong peers. This occurred soon after the Prime Minister of Greece, Lucas Papadermos, issued a warning that the country was close to facing an economic downfall soon. He stated that this is likely to happen as early as June this year. New Zealand and Australian dollars too fell, when the demand for assets with high yielding capacity dropped, resulting in losses in stocks in Asia. The Yuan too faced the same situation as the dollars and euro, with the central bank in China reducing the daily reference rate to an extent that it was the lowest since November 2011. The step to lower the rate was taken in light of the possibility that the debt crisis in Europe will lower the demand for goods. A currency strategist stated that the euro will face steady pressure in the coming months. This pertains to dealing with the current debt and starting new debt. The current situation is such that investors are not likely to be interested in trying their luck with the euro. In the past 30 days, the euro has fallen and performed badly when compared to the currencies from other nations. This has pushed investors to seek safety in the middle of the turmoil in the region. A foreign exchange research analyst stated that currently, there are two safe havens. One of them is the Japanese yen and the other is the US dollar. By the end of March, the euro is likely to fall to $1.20. The country that recently sold ten-year bonds was Germany. The demand it brought in was significantly lesser than what was five years ago. 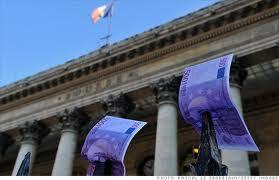 France is auctioning bonds for twenty years – from 2021 to 2041.